Taxi drivers tell tourists that Center City is a "shining city on a hill". During the Industrial Era, the city almost urbanized out to the county line, and then retreated. Right now, the urban center is surrounded by a semi-deserted ring of former factories. The characteristic American behavior called volunteerism got its start with Benjamin Franklin's Junto, and has been a source of comment by foreign visitors ever since. It's still a very active force. With a long history of welcoming and assisting the poor, Philadelphia has always risked swamping the lifeboat by attracting more of them than it can handle. Colonial Philadelphia can be seen in a hard day's walk, if you stick to the center of town. In 1751, the Pennsylvania Hospital at 8th and Spruce was 'way out in the country. Now it is in the center of a city, but the area still remains dominated by medical institutions. 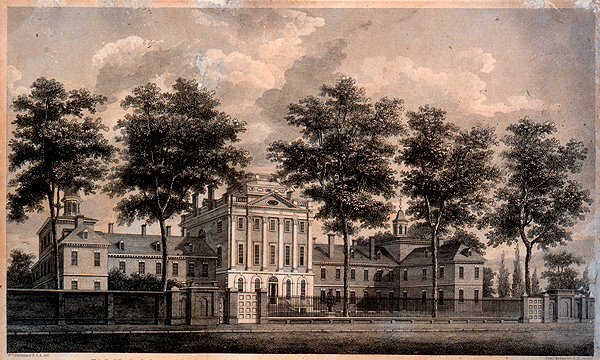 The first hospital in America generated the first medical school, the first medical society, and many of the unique features of American medicine. In modern times, the gusher of federal research funds not only distorted academic medicine, but academia as a whole. There is a painting of the region around 8th and Spruce Streets in the 1750s, depicting a pasture, with cows, and three or four buildings between 8th and 13th Streets. When the Pennsylvania Hospital moved there in 1755 from its temporary location in a house located a block from Independence Hall, there were complaints that it was now located so far out in the woods that it was difficult and dangerous to go there. Still another description of the area is evoked by the provision which the Penn family placed in the deed of gift of the land, strictly forbidding the use of the land as a tannery. Tanneries have always been notorious for giving off noxious odors, so most people wanted them to be somewhere else, anywhere else. In any event, the main activity of Penn's "green country town" at that time was concentrated closer to the Delaware River, and the nation's first hospital was definitely placed in the outskirts. Two blocks further West the almshouse was already in place, but not much else. We are told that Benjamin Franklin had flown his Famous Kite at 9th and Chestnut, using a barn there to store his materials. It might be recalled that the population of Philadelphia, although the second largest English-speaking city in the world, was only about twenty-five thousand inhabitants at the time of the Revolution, and in 1751 was even smaller. In any event, the first and oldest hospital in America was built on 8th Street between Spruce and Pine, and the Eighteenth Century buildings on Pine Street still present a breathtaking view at any season, but particularly in May when the azaleas are in bloom, and fragrance from the flowering magnolias fills the evening atmosphere for blocks around. Although some people today mistake the Pennsylvania Hospital for a state hospital, it was founded in the reign of George II, decades before there was such a thing as a State of Pennsylvania. The Cornerstone was laid by Benjamin Franklin, with full Masonic rites. Most doctors regard a hospital as a mere workshop, but the affection with which many Pennsylvania physicians regarded their special hospital is indicated by the number who have requested that their ashes be buried in the garden. For two hundred years, beginning with the first American resident physician Jacob Ehrenzeller, the interns and residents were paid no salary, so they had to live on the grounds. An Interne was just that, interned within the four walls for at least two years. Because the resident physicians had no money, they stayed in the hospital at night and on weekends, playing cards and swapping stories. The hospital was home for them, as it was for the student nurses, likewise unpaid but more strictly confined and supervised. This penury seemed acceptable because the patients were mostly charity ward patients, otherwise unable to pay for their own care. Ehrenzeller finished his medical apprenticeship and went to practice for many decades in the farm country of Chester County, but gradually upper-class Philadelphia moved from 4th Street westward to and beyond the hospital, and two of the richest men in American history, Morris and Biddle, had houses within a block of the hospital, although Morris never lived in his house, having more pressing matters in debtor's prison. Therefore, later resident physicians at the hospital had the potential of setting up private practice in the area and becoming society doctors as well as academically prominent ones. Being a charity hospital in a rich neighborhood created the potential for volunteer work by the town aristocrats, and large bequests for charity. The British housed their wounded in the hospital during the Revolutionary War, and shot deserters against the red brick wall of the small cemetery to the north. A century later, there were a couple dozen rooms for private patients in the hospital for the convenience of the doctors and the neighbors, but everyone else was a charity patient. And a century after that, the hospital still did not have an accounting department to collect bills, and tended to regard people who asked for a bill as a nuisance. Benjamin Franklin is regarded as the Founder of the hospital, and his autobiography famously describes how he fast-talked the legislature into matching the donations of the public, not mentioning to them that he had already collected enough promises to see the project through. This seems in character; Franklin's biographer Edmond Morgan summed up that,"Franklin doesn't tell us everything, but what he does tell us, is straight." The idea for the hospital was that of Dr. Thomas Bond, whose house is now a bed and breakfast on Second Street, , but it was characteristic of Franklin to be the secretary of the first board of managers of the hospital. In Quaker tradition, the clerk of a meeting is the person who really runs the show. It thus comes about that the minutes of the founding board were recorded in Franklin's own handwriting, among them the purpose of the institution, which is to care for the Sick Poor, and if there is room, for Those Who can pay. This tradition and this method of operation continued until the advent in 1965 of Medicare, when charity care was displaced by concepts which the nation had decided were better. The Pennsylvania Hospital was not only the first hospital, but for many decades it was the only hospital in America. Its traditions, sometimes quaint and sometimes glorious, cast a long shadow on American medicine. We who trained at Philadelphia General Hospital have been known to differ with the statement that Pennsylvania Hospital is the oldest in the United States. PGH, founded as an almshouse in 1729 (with a medical staff to care for indigent residents) evolved into a municipal hospital. although not founded as a hospital, it served that function before the founding of the Pennsylvania Hospital, and many of us feel it deserves the distinction of America's first hospital. Keep these articles coming as they've oepned many new doors for me. My son is 6 years old and was born with Cystic-Hygroma. He'll be 7 on September 25th. Can you guys help us with the surgery. Without the money,no one's helping us. We are from #76, Back Street, Tunapuna, Trinidad, W.I. My phone # is 314-5176. Just to rectefy the fact. The oldest hospital in america is The Hotel Dieu in Quebec Canada. It was found in 1639.